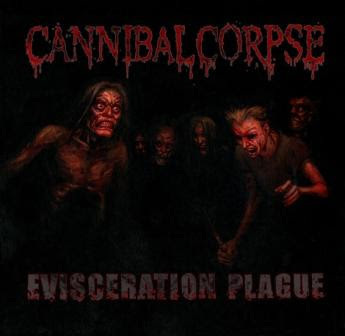 Cannibal Corpse - "Evisceration Plague"
The latest album from one of the OG's of death metal is one of its finest. Cannibal Corpse has consistently put out albums of high quality for 20 years and while many of their contemporaries have died out and had to make comebacks, CC have never wavered. This new album has the same brutal riffs and caustic vocals that we have all come to love. The title song, also the lead single, has a little bit of a slower tempo, which a few of the other songs contain as well. However, they are able to use the slower tempo to create a heaviness that still pummels the listener just as much as the faster songs. That was one of the first things I noticed about the album was that the tempos varied more than usual for a pure death metal album. This extra layer to their songwriting really made the songs stand out from each other as opposed to most of them blending together, which can happen a lot on death metal releases. However, that does not mean that CC have completely changed their sounds. They are still the same old CC that we have all grew up with. The lyrics are still the same brutal and disgusting verses that make them so amazing. "Beg for your life, you won't escape the knife Your fate was sealed today Disease has spread, you pray for death Evisceration plague." That lovely nugget comes from the title song and brilliantly displays the death and destruction that CC have always had. This album is great for the original fans that have always loved the band yet also should bring in new fans. This is a must have for all the classic fans of death metal.